1.In SPECTO WORLDS there are four difficulty levels. 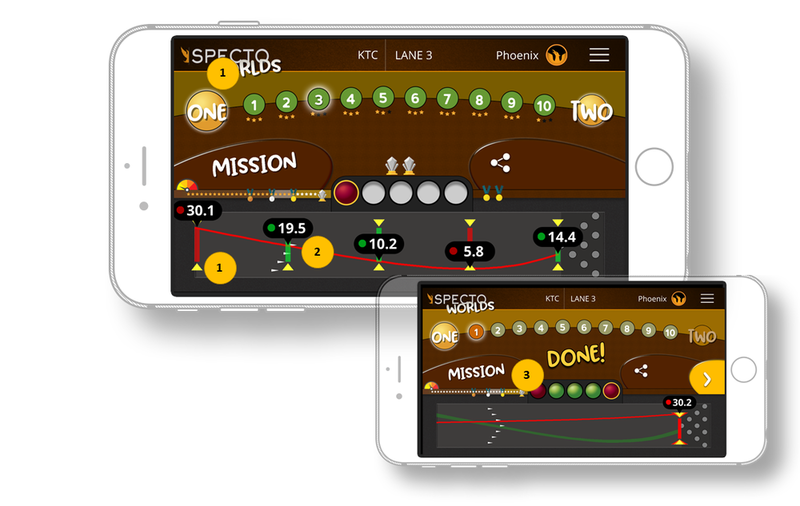 You can select between NOVICE, AVERAGE, EXPERT and SUPER STAR levels to test yourself. 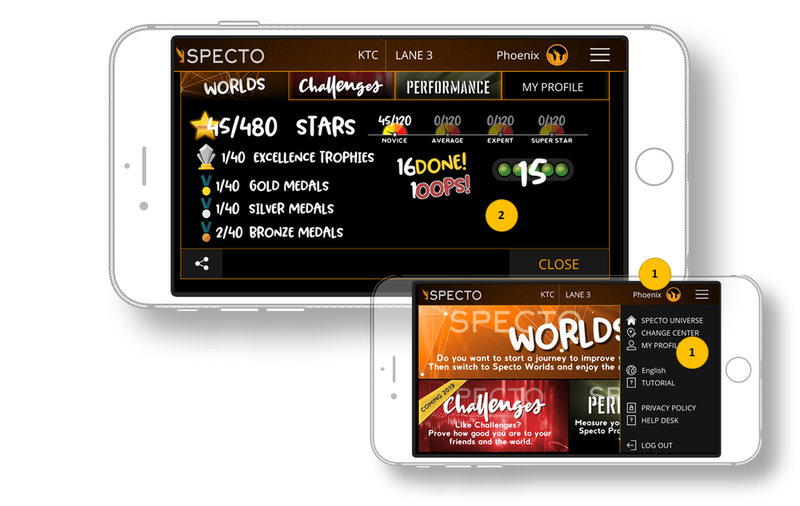 We recommend you start your journey by selecting Novice and WORLD ONE to learn the Specto WORLDS experience. 1.Difficulty gauge and the colors shows which difficulty level you are in. 1.In each LEVEL you have a MISSION to complete. 2.You have 5 shots for each mission. One successful shot (Green ball) is enough to continue to the next level. 3.Five successful shots is the best performance for each level. 3.The marks on the lane also help you to see your target and the ranges. 4.Share button enables you to share your Specto World experience with your friends via Social media, emails or text message. 1.The marks on the lane help you to see your target and the ranges. 2.When you make a shot, your most recent shot line will be show in either green or red. Green shows it is a succesfull shot and red shows that the shot failed the required tasks. 3.Green and red balls also show the results of the attempts. 1.You will be reminded about your next goal during your missions. 2.A medal meter on your mission and level screens shows you your status. 1.Tapping on your name or MY PROFILE from the hamburger menu enables you to reach your statistics. Your star count gives you a medal or trophy. You can always go back and replay your levels as much as you want. Your best score will always be counted. If you pass a level but you are not happy with your performance, you can always go back and replay to get more stars. Your best earned stars will always be counted. You have to make one successful shot to win a star and move to the next level. Otherwise, you have to replay the level again. If you move to the next level, you can always go back and redo it for a better score. Your best score will always be counted.